Why attention to the little things is what creates surprise and delight for your customers. A company that gives you the chance to use mementos to make a lasting impression. Blockchain and the future of CX. Why the customer experience glass is half full for some CX leaders, and half empty for others. If you have a work email address, you know that it’s common to get a hundred emails or more in a day, and that the emails from salespeople wind up in the digital garbage can. In Dan’s article for Forbes, “3 Ways to Stand Out From All the Other Salespeople,” he suggests snail mail as a way to create surprise and delight and stand out from the crowd. We look at Punkpost, a company that will send custom-made, handwritten cards on your behalf. Joey Coleman: It's shocking how often people use 38 words to describe something when two would do the trick. We are looking at you, lawyers and accountants. Words matter, and there is no excuse for trying to hide what you mean. We explore words and messaging in this next generation of Say What? Dan Gingiss: That's what it feels like for sure. Joey Coleman: [inaudible 00:01:18] It's kills me. It's kills me. Dan Gingiss: Frankly, the ones from salespeople generally go to the bottom of the pile, and there are many of them. That was the whole point of the article, was to say, "Hey, stop sending these typical emails that we see every day, and do something different," so I talked about snail mail as one of those ways. Just really quickly, for those that don't work in big companies, or really, if you work in any office, you probably know that you don't get a lot of mail at work, right? You come home and you get lots of junk mail, but at work, getting mail is rare. So when you get mail at work, you open it because it's different. It stands out. I remember a time where I got a book in the mail from a company that, frankly, I had a very bad opinion of and had used previously. There was no way I was going to use them again. But they sent me a book by their CEO, and I felt compelled to respond to the salesperson, even if to say to the person I'm not interested. But I felt compelled because he had sent me this book in the mail. Had he just emailed me, I would have hit Delete. What was really interesting was that he got back to me and he said, "Thanks so much for letting me know that you're not interested. You just saved me a lot of time. Enjoy the book." In any event, I recommended snail mail and when I published the article, I was hit up on Twitter by the fine folks at a company called Punkpost. They saw the article and they mentioned that their product can help companies with snail mail in a way that is, as they put it, "easy and fun." I asked them to tell me a little bit more about what they do, and here is what they said: "Punkpost sends beautifully handwritten cards mailed by artists for you. Customers place orders via the Punkpost app or online platform in the amount of time it takes to send a text. From there, one of our 60-plus US-based handwriting artists get to work turning a typed message into a custom handwritten design on a card of your choosing, and it's in the mail within 24 hours." "Here's why handwritten cards are important. They create loyalty for your community. They make you stand out from the sea of emails. People don't print out emails and hang them near their desks. They do, however, keep Punkpost cards on desks, or even hang them up on walls. Every time they see those cards, they're reminded of you and your business. They're low cost, but have a big impact on how customers view your business, and they have the power to close deals. After receiving a card, your prospective customer knows you care and are invested." "What is Punk Post great for? Well, thanking clients for business renewals, celebrating clients' birthdays and one-year anniversary with you. If you're a realtor, it could be to celebrate a houseversary. Thanking prospective clients for chatting with you, celebrating employee's birthdays, sending holiday cards to customers and partners, or celebrating big life events of customers. Lastly, showing gratitude and thanks to your community." "Overall, Punkpost is a dashboard for creating and managing happy moments. The first card is free on the app, and after that, they start at $5. For more info, or to start sending [inaudible 00:04:26] today, visit punkpost.co. Follow us at punkpostco or download the app for iOS." Joey Coleman: I have to say, while I have not yet had the opportunity to receive in the mail my Punkpost card, even going to their website and checking it out was an experience. What they're doing, I think, is absolutely fantastic. For those of you, and we'll have this in the show notes, but it's punkpost.co, so P-U-N-K, Punk, post, P-O-S-T.co. What I love about this is they are bringing a sense of personality, a sense of creativity, a sense of art back to a medium that most businesses and, frankly, most people have shied away from. It used to be, and I realize I'm dating myself here a little bit, Dan, but it used to be when you got home from work, or you got home from school and you went to the mailbox, it was filled with postcards and flyers and brochures and catalogs and maybe five, 10, 20, 50 pieces of mail per day that were coming to your house to promote services, to promote offerings, to showcase products, etc. Joey Coleman: Yeah, yeah. Please. I wish, I wish. But, you know, this is how it worked. Then comes along email and, suddenly, businesses realized, "Wait a second. We can send the same communications for free. We can do this a lot easier, a lot faster, a lot quicker, with a lot less headache and a lot less cost. We should send emails." The problem is the original inbox, the postbox, the "Oh, gee" inbox, if one will, became empty as everybody rushed to the email inbox. But what I love about Punkpost is they are doing something which, as you mentioned, not only is something that I'd recommend, I know it's something you recommend, they are bringing the conversation back to the mailbox in a way that is fun, is creative, is different, and is going to create an experience for the recipient. Dan Gingiss: Or to use your favorite word, it's remarkable, right? It is something that, as you mentioned, is something that people put up at their desk or put up on a bulletin board. They save the card. If your message is on that card and it's got some accompanying artwork, this is marketing. This is ongoing marketing that goes beyond the one-to-one. That's what I thought that was really interesting. I really appreciated that they, obviously, read my article, but they are subscribing to this and this is ... I'll tell you, it's a service I haven't used, either, but I'm planning on it because I think that it is ... I can certainly write my own notes and my own cards, but I love that there is this sort of artistry onto this, which makes it more unique and makes it remarkable. Because, let's face it, even when you get a handwritten card, usually, you read it and you say, "Oh, that was nice," and then, you recycle it. This idea that these cards are saveable and frameable or put-up-on-the-wallable ... I know I just made up a word. Dan Gingiss: Yup. I think that's what made this really unique, and so, that's what stuck out to me. Joey Coleman: I completely agree. What I really love about this is it gives you the opportunity to create a memento. It gives you the opportunity to create an interaction. Your customer, your prospect is going to delete your email, right, or best, archive it when they're done with you. These cards, I get the feeling this is the kind of card somebody would frame, or they would leave on their desk. One of the things I often ask when I talk to audiences about thank-you notes is I'll say, "Okay, I'd like everybody in the audience to raise your hand if somewhere at your home or at your office, you currently have a thank-you note that you've received in the past." Every hand goes up, right, or almost of every hand, tons of hands go up. I said, "Okay, great. Put all your hands down." Then I said, "Now, if that note you just raised your hand referring about, raise your hand if you received it in the last six months," and less than 10% of the hands go up. What that shows me is if we create something memorable, if we create something remarkable, if we create a memento of the interaction, and it's artistic and it's creative and it's fun and it's unique and it's different and it's special, the people we send it to will hold onto it. What I really like about the way Punkpost works and ... Let's be clear, folks, if you head over there. It's not inexpensive in the sense that it's $5 per card. But if you were going to go to the store and buy a greeting card and hand-write your own letter, and then, mail it, you'd probably be in the $5 range anyway, right? I mean, you'd certainly be moving in that general direction. This is supereasy because you actually do it from the app. You pick your card. You are able to go ahead and put in the address and you write your message, so you get to customize it with your message. You type your message into the app, and then, a handwriting artist does beautiful calligraphy, or there's a lot of different styles they do, to translate the handwriting style into something special for the recipients. I love this idea. I'm superexcited to try this out. For all those people who are like, "Oh, I can't write thank-you notes. My handwriting is so poor," or "I never know what to say when I write a thank-you card," or "Oh, it's just too much hassle. I have to wait till I get back to the office to do the thank-you cards, and then, I have to address the envelope and I have to put a stamp on it. Then, I need to take it to the post office to the mailbox," no. You can put this app on your phone. Check it out, Punkpost. Loved this. Dan Gingiss: All right. So quick takeaway is number one, snail mail does stand out in the sea of emails. We get so much email every day that, especially if you're in sales, you have to do something different to stand out. If you've been fortunate enough to already have taken a meeting with a prospect, this kind of a thank-you note is something that will absolutely stand out. 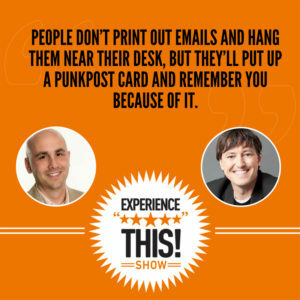 The third thing is that using a service like Punkpost adds an element of surprise and delight as well, which we've talk about a lot in this show, which creates a remarkable experience and, therefore, makes you remembered. Joey Coleman: There are so many great customer experience articles to read, but who has the time? We summarized them and offer clear takeaways you can implement starting tomorrow. Enjoy this segment of CX Press, where we read the articles so you don't need to. Dan Gingiss: This week's CX Press comes to us from Kaye Chapman of Comm100 on a website called CustomerThink. Her article was How Blockchain Could Transform The Customer Experience. I wanted to start here by talking about what blockchain is because I will admit, it is a very difficult concept, and I've had to read about it multiple times to really understand it. I think Kaye did a really good job in this article of explaining what blockchain is, so I'm going to read a portion of it to you. "Imagine you have to send some money to a friend. To do this, you contact your bank and ask them to send the money to your friend's account. The bank has a ledger of transactions. To perform the transfer, it removes the funds from your account, adds them to your friend's account, and records it all on their central ledger. The process is reliant on a single authority, the bank, to perform the transaction and keep accurate records on their ledger. As a consumer, you have to trust that the bank will do this accurately and without corruption. Sadly, this isn't always something that banks are capable of doing." "Blockchain allows for transactions to occur without a single authority to oversee them. It does this by recording transactions on an electronic ledger that everyone can access. Computers all over the world hold copies of this ledger and continuously work to verify transactions registered on it. Transactions made on the blockchain are stored forever, and it's impossible to tamper with them or alter them once they're made. Sensitive information relating to each transaction can be cryptographically" ... That's a tough word, cryptographically. Joey Coleman: [crosstalk 00:13:20] ladies and gentleman. Cryptographically. Dan Gingiss: [inaudible 00:13:22] "Cryptographically secured, meaning that it is only accessible by those with the right keys to unlock it. That information can be disclosed at will by the parties involved in the transaction." Another potential use is in sending goods to customers. IBM is combining Internet of Things technology with blockchain to allow for goods to be tracked along each points of a supply chain. Package location is updated via GPS, and when a section of a transaction is verified as having been completed, we have the option for payments to then be released. Now, this whole process removes the need for customers to argue and prove non-delivery of a package, as that package's data is an objective truth held within the blockchain. Contracts are another area where blockchain can help to make things fairer for customers. [inaudible 00:14:50] can be [inaudible 00:14:51] to customers when companies don't keep to their side of a bargain as the burden of proof often rests on the customer to chase, discuss, persuade and fight for compensation. Blockchain technology can be used to implement smart contracts where contractual breaches can be tied to automated consequences, for example, refunds where a service is not delivered on time. I can see the ISPs, phone companies and other service providers could differentiate using this technology. Lastly, blockchain is being explored to achieve the decentralization of customer data. In the future, the possibility of customer data breaches could be hugely reduced if that data is held on the blockchain and disclosed by customers at will, rather than held within individual companies, who sometimes keep a lot of data they don't always need. Now, that's exciting for anyone who's concerned about information security and even more exciting for businesses who currently spent millions of dollars on compliance costs every year. Joey Coleman: Well, first of all, let's be abundantly clear. Most people would much rather listen to Kaye Chapman be in charge of this podcast than Joey Coleman and Dan Gingiss. Dan Gingiss: Right. Totally love this [crosstalk 00:16:22]. Joey Coleman: So amazing. So amazing. What I love about Kaye is that, first of all, she wrote a fantastic description of what blockchain is because, like you, I've read a good amount about blockchain and I thought her description was very succinct. Using this example of money in the bank and the transfer amongst friends was, I think, a clear way to kind of outline how blockchain works. Then, she also segues into the conversation about tracking packages. I spend a decent amount of time sharing tracking numbers of things I'm doing with other people. "So here's the confirmation of the wire transfer we just did." "Here is the confirmation of the UPS or FedEx tracking number for the shipment I just sent you." I'm regularly sending these confirmations that, thankfully, those companies provide, but then, the person who clicks on the link is hoping that the transaction is live, and they know where it is, and they're able to track and get their information. But one thing that I think is fascinating is have you ever had this experience, Dan, where somebody sends you a tracking confirmation, and you click on it, and it says that it's not available for tracking yet, even though you have the number? Have you ever [crosstalk 00:18:11]? Joey Coleman: Okay. This happens all the time, and it drives me crazy. It's one of the things I tell about my clients. I get that you want to send the tracking information, but don't ever send a link that when the customer clicks on it, it isn't going to be live and it isn't going to be able to give them information to the minute. That's one of the potentials, I think, for blockchain, is because it's running in the background, it's computers, it's writing to this master ledger. You'll be able to see, as Kaye described, everywhere in the process, where your money is, where the package you ordered is, etc. Dan Gingiss: Yeah, and I thought the other point that she made that was really relevant, given the news lately, is this whole idea of decentralization of customer data. The problem with all of these breaches and these privacy issues that we've had anywhere from banks to Facebook has been that, once your information is out there, it can easily be misused and identity stolen and all this sort of thing. So, we're left with constantly changing passwords and more and more complicated rules for passwords which, of course, the data says doesn't even matter, but it just makes our lives more miserable. This technology does help to eliminate that because you don't ever have your data sitting in one place owned by one person who then can accidentally get hacked and lose it. I think there's some really interesting things here. I'm going to jump to the takeaways from her article, but I highly recommend you go read the article. It is a long read, but I think if you're interested in this technology, it's a really good read and we'll, of course, include the link on our show notes at experiencethisshow.com. Takeaways are, number one, that blockchain technology is already here and, although there are limited applications today, most notably bitcoin and those transactions, this is something that we need to keep an eye on. It's not maybe altering the entire customer experience today, but this is something that we want to be aware of because it is going to affect it tomorrow. Dan Gingiss: ... and I was thinking about that. I was so frustrated because I was late. It was one of these where I woke up in the morning and hadn't planned on ironing my shirt and noticed my shirt was wrinkled. I'm, like, ugh. It's funny you should mention the iron. We didn't get a chance to talk about this. I had an experience recently where I was at a hotel that had a beautiful, beautiful sink with a faucet that, when you turn on the faucet, it was like a river rushed out at you. It kind of came down the spout, and then, splayed all over the sink. It was a spectacular view, until I needed to iron. I'm holding the iron underneath what is, literally, a waterfall of water. It's all over the place. It's soaking me, it's soaking the bathroom. The entire iron is coated in water, and all I could think of was my buddy, Dan Gingiss, in that moment. Dan Gingiss: That's great. Anyway, I had a different experience recently, actually two of them, and I wanted to bring them up here. 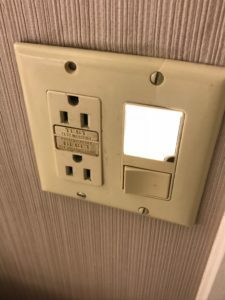 A couple of weeks ago, I was in a hotel room and I noticed in the bathroom that there was a small light up pad right where the light switch was. It was light-activated, and so, when you turn off the light in the bathroom, this little pad lit up. It was kind of like a nightlight, and I thought I was cool. I'll post a picture of it on our show notes. It just was memorable to me because it was just enough light to kind of identify where the bathroom is, right, because we've all woken up in a hotel room. It's a foreign place. We're not familiar with it and it's dark and you're stumbling over the room to get to the bathroom. I was like, "Yeah, that's really nice that they put this little light up pad." It wasn't too bright so it didn't make the room bright or anything. Anyway, I took a picture of it because I always do things like that. I just kind of sat on it and thought, didn't do anything with it. Then, last week, I was in another hotel. This hotel took this idea one step further, and then, I decided, "Now, I have to talk about it." 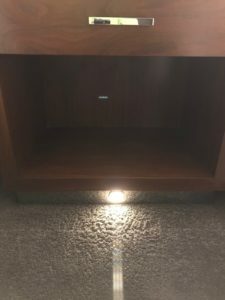 In this hotel, the bedside table had a motion-activated light right underneath it. So, when you got up in the middle of the night, which I did, as soon as you put your feet on the floor, this night light turns on. It's a little light, but it literally lights the way, the path, to the bathroom. Then, after 10, 20 seconds, it goes off again. I thought this was so brilliant because, first of all, it solves a customer pain point, which is, I'm getting up in the middle of the night and I'm stumbling and banging into things because I can't see and I'm in a foreign room. But I also thought that what was interesting is since we've talked about with the iron example, that the problem there is the guy who puts the faucet in and the guy who is in charge of the iron didn't talk to one another. What occurred to me was that somebody probably had to sleep in that room to understand exactly where to put this light and to do it in such a way that it worked, right? Somebody had to step in the customer's shoes to really confirm that this was the right placement and that it was bright enough and all that sort of stuff. That's what really impressed me. Joey Coleman: I actually have not, and I'm totally intrigued and now want to stay at that hotel. Because I think, to your point, it's a great example of being customer-centric and paying attention to the fact that, of course, the people in the hotel are very familiar with the layout of the rooms, but a customer, I don't know about you. There are a couple of hotels that I stay at regularly, but for the most part, every time I stay at a hotel, even if it's a new hotel, even if I'm staying within a specific chain, which I usually do, it's a completely different experience. What I love about this story is we can approach this from one to two ways. We can design for the customer experience from the outset, or we can retrofit to fit the customer experience. Now, in this particular instance, I'm not sure and I don't know if you know, Dan, whether they built the room, and then, installed this motion-activated light underneath the bedside table, whether the table came with that installed, or whether they built a prototype of the room before they even went into construction and tried to figure out all the things they wanted to do when it came to the layout. But I think, all too often, businesses feel kind of trapped by their legacy decisions and, as a result, they say, "Well, it would be nice, but we'd have to remodel all of the rooms to have a solution." It's like, no, you don't have to. You just have to understand what the problem is, and then, get creative to find a solution. I did take a picture also of the second one underneath the bedside table, and I'll post that one as well. I didn't quite get into the light in trying to figure out how exactly it was installed on the table, but you bring up a good point. Since it was the first time I'd ever seen it, I sort of assumed that it was built into the bedside table, but it very well could have been put in afterwards because I know that kind of lighting is available. It's not very complicated. It was a very little light, but again, just enough light to light the way. Takeaways here, we've talked about this before many times, the little things matter. I brought this up because they are little things. The lights, these little tiny lights are little physically, and they're little in the sense of their place in the overall customer experience. But it is one of those things that's memorable, and that kind of stands out especially when you use it when you need it. As we talked about before in the last segment about security and privacy, I would say this is also a security and maybe safety measure, which is also paramount to the experience. When you're staying in a hotel, safety is something that the people are concerned about. There's a lot of ways that safety can play a role, but one of them is, is you don't want to be stumbling around a dark room. I think that's why this works so well, is that it solves a potential pain point. Then the third is, as I mentioned, I felt that this demonstrated a really good sense of walking in the customer's shoes or the guest's shoes, or maybe their slippers, since they're coming out of bed. But I thought this really, in order to have worked well, somebody must have experienced it, which I think, again, was standing in opposition to the iron example. So great job and let's see more of this kind of innovation in our future hotel space. Dan Gingiss: Okay, Joey. This week's number is 47%. What do you think it means? Joey Coleman: Dan, I'm going to go with this. I live high in the mountains of Colorado, and I would say there is about a 47% chance that one Mother's Day we're going to get a minimum of three feet of snow because that's just the way it works around here [crosstalk 00:29:42]. Joey Coleman: We got a foot and a half yesterday. Last year, on Mother's Day, we had over four feet of snow. Joey Coleman: So I'm committed. I'm going to say that 47% chance, this is me being a meteorologist today, 47% chance of at least a foot of snow. Dan Gingiss: Well, folks, we're going to come back in a future episode and tell you whether Joey was right. But, in fact, as usual, that's not what I was talking about. I was talking about 47% of modern customer experience leaders are considered optimists. They say that their current customer experience strategy isn't performing its best, but they're preparing for the future. Joey Coleman: I think two things. Number one, if you have the choice, ladies and gentlemen, I think it's always better to be an optimist than a skeptic. Joey Coleman: I just think and, you know, that some people may say I'm looking at the world through rose-colored glasses, but I think that's the goal. But what I will say about the skeptics, it's not surprising to me, that it's close to a 50-50 split. It's not, but it's pretty close to an even number. In some ways, that didn't surprise me much because I think customer experience is really difficult. I think it's a daunting job. It's a daunting industry and kind of career path profession because so much is changing all the time. Not only in terms of what your customers are expecting, but what your organization is actually able to do via the technology, via the resources, the human power, whatever it may be, and so, there are so many variables that are in play at any given time. I can understand why folks might end up skeptical and fearful that they're not prepared for the future. 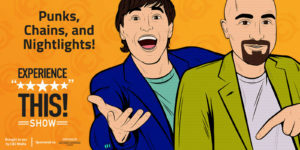 But that being said, I know the folks, especially that listen to this podcast, are the kind of people that are lifelong learners, that are seeking to keep a finger on the pulse of customer experience and pay attention to what's going on and experiment and try new things. I imagine no one listening to the show today this was the first time they had heard of blockchain. They may not be using it in their business yet, but they're aware of it and they're paying attention to it and thinking about it, so I'm excited that the majority of people are optimists.